I said last week that I have recently become a big fan of Butternut Squash. It’s so sweet & yummy to my taste buds, I just love it!! I could honestly just cut it up, bake it till it becomes tender & enjoy!! As you already know, I do like it as a Butternut Squash Macaroni & Cheese. 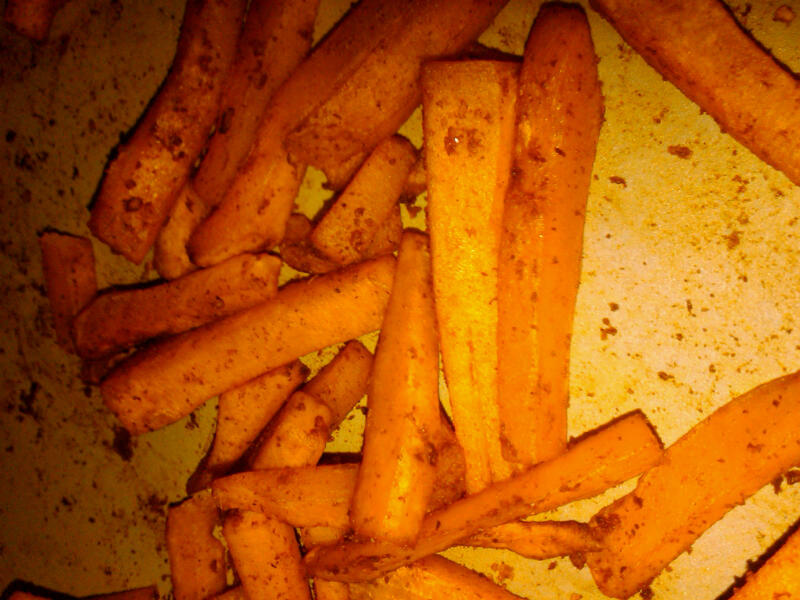 But, I also really, really like it as Butternut Squash “Fries”. I got this recipe from the Biggest Loser Cookbook. And it’s husband AND kiddo approved!! Cut both ends off the squash. Using a vegetable peeler, peel the rind from the squash until you’ve peeled away the pale orange outside layers. Discard the rind. Cut the squash in half lengthwise. With a spoon, scrape out the seeds & discard them. Cut 8oz (about 2 cups) of ‘sticks’. (Refrigerate the remaining squash for another recipe). Place the squash sticks in a medium mixing bowl. Add the oil, paprika, cayenne, garlic powder, onion powder, and salt. Toss to coat. Transfer the squash to a baking sheet so the sticks are in a single layer and do not touch. Bake, turning the squash about every 5 minutes for 22-25 minutes, or until the outsides are crisp and the insides are tender when tested with a fork. Serve immediately. I like the “goodness” better than regular old potato fries and I like the taste better than sweet potato fries (and actually even better than white potato fries too!! ), so that’s it Works for Me. Butternut Squash Fries is linked to Works for Me Wednesday at We are THAT Family. Most every Christmas (and birthdays, mother’s days, father’s days, etc.) I do all the shopping … even for my husband’s family. What a slacker he is!!! Kidding. Sort of. I am also the one to wrap the presents. So when it’s time to load up the car with presents for each family he doesn’t have a clue what’s going where! Many years ago, I decided to dumb it down for him … by paper! I usually buy 3 different gift wrap rolls in coordinating colors. I’ll wrap all his family’s presents in one color. My family’s in another & our personal little family’s presents in a third. That way, when we’re walking out the door I can just tell him to grab all the wrapping paper that looks like “this”! It works for me! 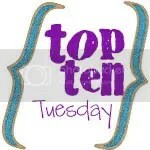 For more Works-For-Me Wednesday or to link up your own tips, visit We Are That Family! I originally saw this idea when Impress Your Kids linked up to My Sweet & Simple Life. Evan is all about the calendar these days. He wants to know when his birthday is, when Christmas is, when … well any other holiday that equates to him getting a gift!! 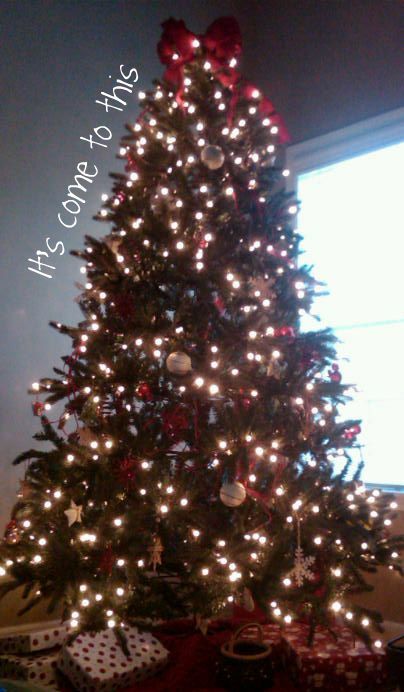 So when I saw this Activities Tree I thought I would use it as a way for our family to countdown to Thanksgiving Day. If you know me in real life, then you know I am anything BUT crafty!! So you might be surprised when I decided to do this. The inspiration piece was made of construction paper & then she laminated it so she could use it for different seasons throughout the year – brilliant!! So I started on my mission … and I actually finished it (almost) the very same day!!! Another shocker for me!! *Note – I got super lucky & the birch wood was the exact same cut/size as the magnetic sheeting – no cutting required!! Several sheets of printed paper – remnants worked perfect! Line one side of the birch wood with the Self-Adhesive Magnetic Sheeting. Glue paper to the magnetic sheet to make “pretty”. Cut out the shape of a tree (I’m not crafty enough to have branches!!). Cut out all the leaves (I just made one free-hand then traced & cut the others so they’d be similiar in size & shape). Write the numbers for each day of “the count” on each leaf.Glue the leaves to the small magnetic tape. So if you don’t know me you may not be impressed but if you do then you should give me some comment love & pat me on the back … Either way, it works for me! 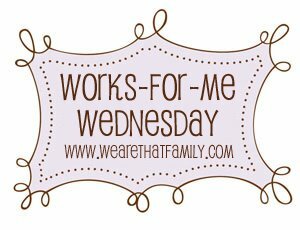 For more Works for Me Wednesday ( it’s the Holiday Edition) or to hook up to your own, visit We Are That Family!